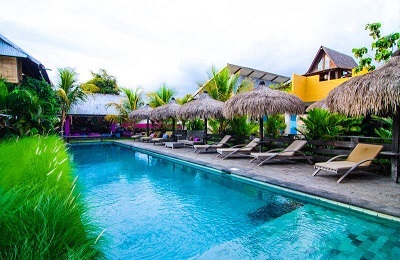 Boutique Eco Surf Resort - near T-Land, Rote Guests overall rating: ★★★★★ 5 based on 2 reviews. 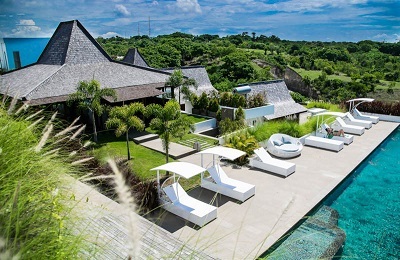 We proudly present this stunning Boutique Eco Surf Resort located on the Island of Rote and close to the famous T-Land (longest wave in Indonesia), offering unforgettable experiences and making positive contributions to the community. You’ll find yourself immersed in natural beauty, Manduna rock is home to a large number of nesting birds, it is right in front of the Boutique Eco Surf Resort. Panoramic Beach: Beautiful and Luxurious with panoramic views to Manduna Rock, the Boutique Eco Surf Resort pool and the ocean. The Triple Rooms: 2x triple rooms located on the ground floor facing the pool and the beach with air conditioning and ensuite bathrooms. The Double/Single Rooms: These rooms have a flexible bed configuration for either single or double occupancy and can also fit a baby crib if needed. The Exclusive Bungalow: 2x exclusive bungalow suites, one is located on the ground floor, the other on the 1st floor. It features a kitchenette, living room, and has a view of the courtyard. Our excellent Chef has designed a menu using fresh local ingredients to create flavorful and healthy dishes. Included in your stay, all guests are treated daily to a delicious breakfast, lunch, and dinner. We can also cater to any dietary restrictions our guests may have. New resort, new beds, new pillows, new sheets. Rote gets habitual electricity black outs, but we have two massive generators with capability to provide energy to the entire resort. Unlimited surf transfers to T- Land the main wave. Located in the right side of the channel that leads to T-Land, Bombies has left and right being a great alternative for uncrowded surfing and a good spot for Tow-In. Although it is a consistent spot it works better with bigger swells. Get ready for a short thrill ride at this hollow right in the North zone and with access only by boat which makes it usually uncrowded. Locals say it is th 1t wave rode back in 1978. A wave good for beginners on the East zone breaking on a soft reef 100mt off the shore. Very fun wave when other spots are BIG. Tides: All tides, better on low. An intense hollow right that bends perfectly around the reef and when in ideal conditions offers world class barrels in a pristine setting. It is 10 minutes ride from Boutique Eco Surf Resort and a dream for regulars. 10 km away from us is an uninhabited island reachable by boat only taking around 45mins. A nice hollow right breaking over a solid reef. Another uninhabited island, South of Nemberala only accessible by boat and takes around 30 mins to get there. Get ready to surf uncrowded waves and choose from right or left as both are breaking on a channel at the entrance of the main reef and can hold big swells. And our team and captain have a couple more secret spots but you have to promise to keep them secret!!! There is a lot more than the amazing waves and surfing in Rote! 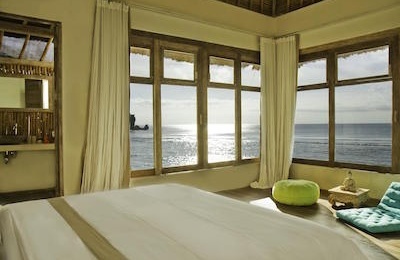 Boutique Eco Surf Resort near T-Land on the stunning island of Rote, Indonesia. In front of the large rock sitting just meters from the beach. Manduna rock is home to a large number of nesting birds, and you’ll find yourself immersed in natural beauty. Unforgettable sunsets and the most amazing sky full of stars you have ever seen. We will assist all guests with their travel needs thru our dedicated travel agent in Indonesia. It basically takes 1 day to get there and 1 day to go back. Travel to Rote begins in Bali/Lombok/Surabaya/Jakarta to get into a flight with destination to Kupang ‘El Tari’ airport. It is then a short 75-minute flight to Kupang, W. Timor, the capital of Indonesia’s East Nusa Tenggara province, then onto Rote by flight or ferry. Note: Due to occasional changes in flight times between Bali and Timor as well as W.Timor and Rote it is often necessary to use the fast ferry between Islands. The fast ferry takes 2 hours and operates daily on the following schedule. The Fast Ferry tickets cannot be purchased on-line. These tickets can be purchase upon arrival or arranged byBoutique Eco Surf Resort in advance or during your stay. First Class Cabin cost approximately $20 each way. Due to the morning departure from Kupang guests traveling by ferry will need to overnight in Kupang prior to their stay at the Boutique Eco Surf Resort. Upon returning to Kupang from Rote by ferry it may or may not be possible to connect with a flight from Kupang back to Bali/Jakarta/Surabaya. Late afternoon flights from Kupang back to Bali have proven to be unreliable, but may be an option. Your travel consultant will have the most up to date details when making your travel plans. No matter if traveling by Charter Flight or Fast Ferry you will be met, assisted and transferred every step along the way by The Boutique Eco Surf Resort concierge in Kupang and upon arrival in Rote. Our ground staff will assist in transferring guests between flights or to hotels and onto the ferry to make certain you have an enjoyable and worry-free experience. Wings Air is a subsidiary of Lion Air. Wings Air flights can be booked via the Lion Air Website. Approximate cost $30 each way + $20 per surfboard, maximum 2 boards per bag due to small cargo compartment on the ATR aircraft. Any items that cannot go into the plane our concierge will make sure it is sent to you at the Boutique Eco Surf Resort thru the Ferry. Take as much material as possible, you will spend most of the time in the water and there are no surf shops around. √ Paddles for SUP or any specific equipment you use. WHERE DO I CHANGE MONEY? On Rote Island or even in Kupang there are no foreign exchange offices, so we recommend you change your currency in Bali or Jakarta before arrival. Anyway, at the Boutique Eco Surf Resort, we have the option to pay with a credit card the activities and drinks of the bar. To guarantee a truly responsible stay during your holidays, you should consider different issues related to your safety and health. There are recommendations that you should follow if you travel to the Lesser Sunda Islands, in the Indonesian archipelago. Passports must be valid for at least 6 months since the departure date. If you drive a vehicle (car or motorbike) you must have an international license. It is compulsory to take traveling insurance when you make your reservation. Please, make sure you and all your travel companions are insured against all illnesses, injuries, accidents, medical evacuation, death, loss of luggage and personal belongings, flight and accommodation cancellation and other travel negligence.